I’m not generally a mystery reader. Nor am I all that likely to pick up a book just because I like the time and place in which it is set. 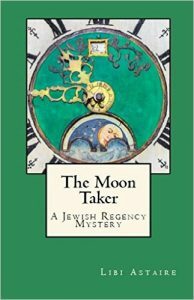 So it was a pure serendipity that led me to Libi Astaire’s Ezra Melamed/Jewish Regency Mystery series, set in Regency Era London. It was a fortunate bit of serendipity, as I could have missed a real treasure. The Moon Taker is a departure from the previous books in the series. The earlier books are narrated by the young daughter of a Jewish clockmaker, who follows the events mostly from the safety of her family’s sitting room. The style is reminiscent of Jane Austen’s austere civility—witty and gritty to be sure, but always framed by the civilized manner of the time. The Moon Taker, on the other hand, takes us out of the sitting room and into the lives of some of Astaire’s more colorful characters. The book’s narrator is a 14 year-old pickpocket known to his friends and accomplices as General Well’ngone. As the “right-hand man” of the self-styled Earl of Gravel Lane, the General’s life centers around the stark and unforgiving concerns of the impoverished: keeping warm and finding sustenance. Every member of the Great Synagogue is supposed to contribute to the charity fund, but we live in wicked times and not all do. The Earl does give something every year, even though we rarely have enough candles and coal ourselves. The Earl insists that, despite outward appearances, we are not truly poor. He says that a person is only truly poor when he feels that he has nothing to give to another. I had to chuckle when our narrator says of a fellow pickpocket, “I do not exaggerate when I say he has seen more ghosts than Kemble’s Hamlet. (A Covent Garden theatre is a warm place to sneak into on a cold night. )” How many evenings did I spend in warm hotel lobbies pretending to be a tourist during my own Bohemian days! The General combines the optimism of the young with the gritty wisdom of the street kid, who faces more than poverty should he slip up. In those days, a pickpocket—even a child—could end up on the gallows. I also should mention here that although our gang prefers not to become involved in violent crime, a person should not be a snob and entirely refrain from making the acquaintance of those who fall outside his accustomed social circle. If the Earl has his enemies, he also has his friends—some of whom you should try to stay far away from, especially after dark. But their mission takes on greater urgency when the murderer sets his sights on the Earl and his lads. And it is here that things take a strange twist: their flight from trouble gives them the perfect opportunity to turn the tables on their pursuer when they are enlisted by a mysterious woman to guard a family heirloom from the very person suspected of the murder. This is where the astronomical part of the plot comes in. The endangered heirloom belongs to an aristocratic family who have made a name for themselves as astronomers. Turns out that a tiny almanac of lunar phases is a key to unraveling the mystery. Now, this is the only part of the story that to my mind falls short, simply because of a missed opportunity to weave the real-life events shaking the astronomical world at the time into the story. These were the days when telescopes were getting larger and more precise, and when the great sport of the nobility was comet hunting. In order to immortalize ones name by discovering a comet, one first has to discount all those celestial objects that look like comets through a small telescope, but aren’t. And so, astronomers made maps of the sky, marking all the dead-ends. This was one of the larger projects during the time our story is set, and was a source of sometimes-acrimonious competition between British and French astronomers. The irony is that those very dead-ends are the real stuff of modern astronomy: galaxies, exploded stars, and stellar nurseries. It’s the sort of irony that would have fit in well with the ironic twists and turns of this story; I would have loved to see this bit of scientific irony woven into the story of the tragic astronomical family in Astaire’s story. But then, I can’t fault an author for not writing a different story! The author’s style, though light and entertaining, is nonetheless thoughtful. There’s a hint of profounder things beneath the quirky humor of the characters and situations. We may chuckle at the image of a young chief among thieves taking on the airs of the British aristocracy. And yet, are the very aristocracy so ironically parodied by the Earl of Gravel Lane not themselves taking on airs? To me, the Earl seems to be quietly laughing at our own pretensions. One thing’s for sure, I would recommend Libi Astaire’s books to anyone who enjoys a good read, even if, like me, you’re not a mystery reader. Step out of your habits and into the lives of the Earl of Gravel Lane and General Well’ngone. You won’t be disappointed. Find out more on Libi Astaire’s homepage: http://libiastaire.weebly.com/.